Anasuya Sengupta has been on the Board of the Nonprofit Quarterly from August 2015. As an advocate, strategist and facilitator for communities and organisations, she has worked nationally in India, regionally across the global South, and internationally for over 20 years. She is committed to amplifying voices 'from the margins' in the virtual and real worlds, while unpacking issues of power, privilege and access. Her work so far has included supporting and strengthening free knowledge, human rights and social justice movements and communities of practice. Most recently, she created and headed the Grantmaking department (now Community Engagement) at the Wikimedia Foundation, supporting Wikimedia communities worldwide in their efforts to create and enable free and open knowledge. Before that, Anasuya was the Regional Program Director for Asia and the Pacific Islands, at the Global Fund for Women, one of the world's largest grant-making organisations exclusively for women's human rights. She has led initiatives challenging violence against women and children, combating religious and cultural fundamentalisms, and supporting sexual and reproductive rights and women's health. Anasuya’s attempts to combine activism and academia include the Association of Women's Rights in Development (AWID) publication - Defending Our Dreams: global feminist voices for a new generation (AWID and Zed Books, 2006) - arguably the first international anthology of young feminist analyses and experience. She holds an M.Phil. in Development Studies from the University of Oxford, where she studied as a Rhodes Scholar. Anasuya's other passions include yarns of both the fibre and wordy kind, hikes through the redwoods, and the challenge of yoga. 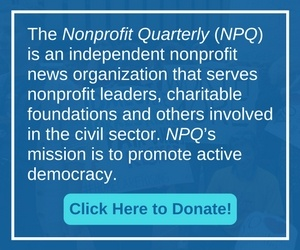 NPQ and YNPN announce a series of articles by young people on issues of equity, diversity, and inclusion to be published over the coming year. Consider them as a challenge to self-reflection and action by your nonprofit.